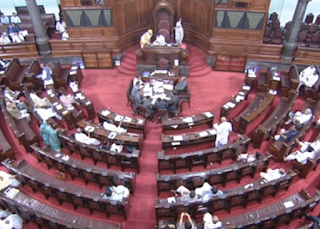 Lok Sabha has passed Commercial Courts, Commercial Division and Commercial Appellate Division of High Courts (Amendment) Bill, 2018. It replaces the ordinance promulgated by President in May 2018 and amends Commercial Courts, Commercial Division and Commercial Appellate Division of High Courts Act, 2015. The Act enables the creation of commercial divisions in High Courts and commercial courts at district level to adjudicate commercial disputes such as disputes related to contracts for provision of goods and services and construction contracts. The amendment is aimed at improving ease of doing business in India. Under the parent Act, commercial courts and commercial divisions in High courts can decide commercial disputes with value of at least Rs. 1 crore. The Bill reduces this limit to Rs. 3 lakh. The parent Act, empowers the state governments to constitute commercial courts at district judge level, after consulting the concerned High Court. It had barred such commercial courts to be constituted in cases where High Court has original jurisdiction to hear commercial cases. The Bill removes this bar and allows states to constitute commercial courts where High Courts have original jurisdiction. The Bills allows state governments to notify commercial appellate courts at the district judge level in areas where High Courts do not have ordinary original civil jurisdiction. These Appellate Courts will hear appeals against the order of commercial court below the level of district judge. It introduces pre-institution mediation process in cases where no urgent, interim relief is contemplated. This aims to provide for the opportunity to parties to resolve commercial disputes outside ambit of courts through authorities. This will also help in reinforcing investor’s confidence in the resolution of commercial disputes. Q. The Commercial Courts, Commercial Division and Commercial Appellate Division of High Courts (Amendment) Bill, 2018 that is passed in the Lok Sabha, allows the commercial courts and commercial divisions in High courts to decide commercial disputes with value of as low as?